1. In order to get my blood sugar back under better control I’ve been put on more insulin. Different insulin. Now I have a pen and before every meal I get to inject. The good part is that the needle is TINY tiny. So far, so good though I still need to get used to remembering to do this BEFORE I eat, not in the middle of a meal!! 2. TWO great race weekends with some wonderful people. You can read about those here ! 3. Found out on Tuesday that my current job contract is not being extended past the end of March. Which…at least it was 2 weeks notice right? So, resume getting updated, recruiters being called and plans for my down time being made (no. Really. This time I *will* clean the office, finish the basement, de-clutter the house, clear out the garage, clean out the flower beds…really, I will!) And of course I’ll get to make at least one extra trip to see Dad and the familia in Houston so there’s that! So, kind of a little up and down couple of weeks — mostly up though to be honest! Spring is approaching – timidly, but she’s on her way! It’s definitely a good time to take a look around and appreciate all that’s good in my life! There is a lot of it! 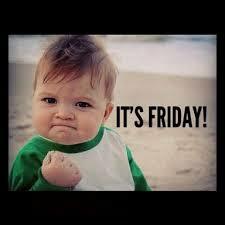 And to top things off — It’s Friday!! ← If You’re Lucky Enough to Be Irish…. Sorry about the job contract, hope you get everything you want accomplished and then get a great new job! And congrats on the MCM, definitely on the bucket list for me! Thanks!! I’ve had this list since about 2009 when I first had an extended time off 😉 But this time I mean it!!! MCM is absolutely one of my favorites — if someone was only going to run one full, I’d tell them to do this one!